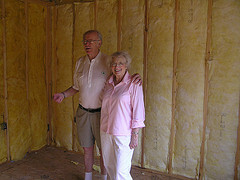 You can make small and even inexpensive changes in the home to make it easier to live in for seniors. Small changes include removing rugs that can pose a tripping hazard, installing new smoke alarms in the home, having railings installed around staircases and porch steps, and changing door handles from knobs to turn handles for easier access. In the bathroom, rubber friction bath mats can help prevent falls and make bathing a more secure function in the home. While these changes may seem small, they can make a large difference in both safety and independence. These changes are also relatively inexpensive, and can be made as aging occurs so a person can keep the integrity of their home as they age. Another benefit to these types of changes is that they are quick to make. Thus, making the home immediately safe and enjoyable for loved ones. As Seniors age, getting around becomes more difficult. In the bathroom shower chairs can be installed as well as a flexible shower head for easier bathing. Padded cushions can be placed on the toilet seat to make transferring easier. Also, installing handles and railings to help steady the body can make transitions to and from the bathroom much safer. Since the bathroom is the most dangerous room in the home, warns AARP, it’s important to make sure the bathroom is as safe as possible for all household members, especially seniors. Other large changes include the installation of a home security system, which allows seniors to be able to call or alert authorities for help in the event of a fall, break in, accident, or fire. This gives families peace of mind, and allows them to keep an eye on their loved ones as well if they choose a monitored service. A monitored system can be leased for nearly any home, and is easy to install both inside and outside the home without disturbing the home’s décor or foundation. If the home has stairs and seniors experience difficulty, then a stairlift guide is an excellent choice. A stairlift provides access to be able to get from one story of the house to another with ease, without having to worry about climbing. These can be professionally installed in the home, and are very safe for all household members, especially seniors. Stairlifts also come with user guides so individuals can know how to use them safely and successfully. When it comes to caring for loved ones as they age, it is imperative to make sure the home is safe. Seniors can enjoy the safety of their current home by making a few small changes. Most of these changes are minimal and cost-effective, and while a few of them may require a bit of renovation, it is well worth it to make sure that Seniors can have peace of mind and remain independent. I have always been an enthusiast when it comes to health and taking care of the body. I believe that true happiness can be partially achieved from exercising both the brain and the body and in my free time I try to exercise, travel, and play as much as possible. When I was 18 years old, I broke my leg from roller skating and since then I have also become interested in the topic of disabilities. Although it was not a very serious injury, I had a lot of time to do research on health and disabilities and came across some really interesting information. Since starting to learn more about health not only for study purposes but as a hobby, I have gained a lot of information on the subject. I would be interested in sharing what I have learned with you. She also writes about Social Security, if you're interested, check out the Disability Application Process here. I tell you one thing that you can install easily and cheaply in the bathroom for senior safety is a grab rail. You can buy them from alot of chains now, I would say ask a professional to install it though, you need to make sure it can hold your weight. There are other options such as easy access baths that can make a whole world of difference too. Thank you for sharing the information. Every little detail helps.